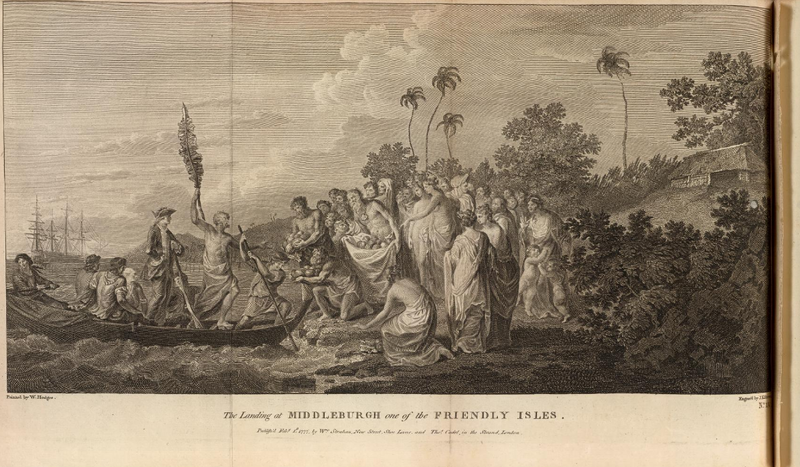 Landing at Middelburgh, one of the Friendly Islands, engraved by J.K. Sherwin after William Hodges, 1777, David Rumsey Map Collection. I covered Hodges' original painting back in October. Hodges actually sailed with Captain Cook, and so is an unusually reliable source for examining common sailors' clothing. It is likely that each figure in his works are based on particular sailors of Cook's expedition. Usually when I come across a print or colorization that is a copy of an original, I include them in the same post. 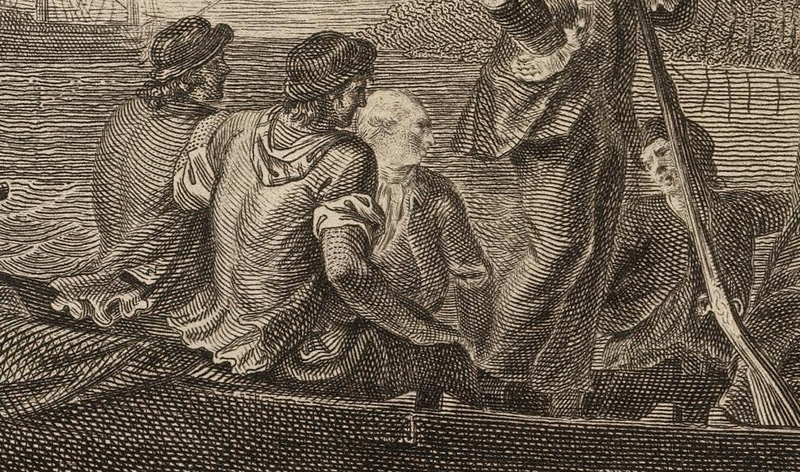 Given that Hodges is such a reliable source, and this engraving make some significant changes to the appearance of the common sailors, I have decided to treat them separately. One of Sherwin's more obvious departures from Hodges is his depiction of the sailor on the bow. 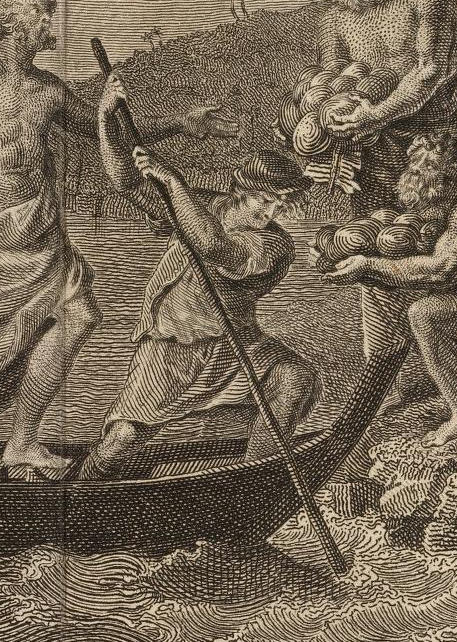 While Hodges' man sports a slight smile and more relaxed grip, Sherwin's mariner is evocative of the coxswain in Watson and the Shark. Sherwin's sailor has loose hair blown in a breeze that doesn't effect anyone else in the print. Both sailors wear the same outfit: shirtsleeves and single breasted jacket rolled up well above the elbows, no waistcoat, a small round hat with narrow brim, and a plain pair of petticoat trousers without breeches beneath. 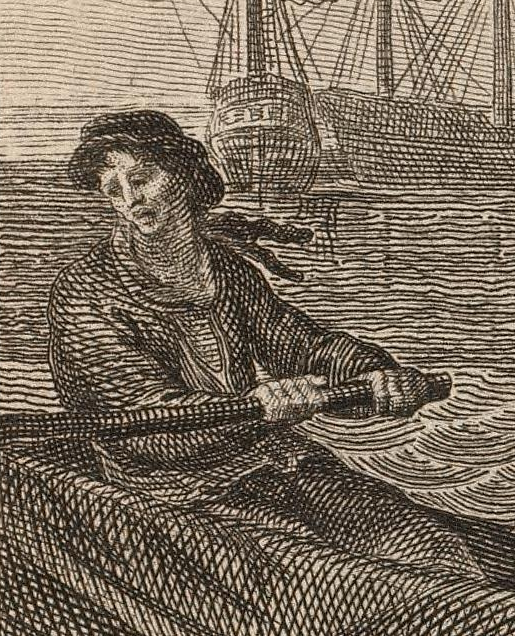 This resurrects the ongoing debate over whether sailors wore breeches beneath their slops. Clearly Sherwin does not think so. Hodges' image is less clear, but could legitimately be interpreted as such. Sherwin's sailors are superficially dressed similarly to the men in Hodges' original. Round hats abound (though of more rounded crowns than the conical ones Hodges depicts), rolled up shirtsleeves, and a patterned neckcloth. There are a couple of key differences. The two men sitting in the boat are shown wearing jackets or sleeved waistcoats, while Hodges shows them in waistcoats. Further, one of the two men in the water is not a sailor but a gentleman with white clubbed hair, a frock coat, and cravat. The coxwain looks considerably different as well. He wears petticoat trousers , an open jacket and shirt with a loosely tied neckcloth that is oddly knotted behind his head, and a floppy brimmed round hat with conical crown.